Mary “Alice” Good, 107, of Melbourne passed away on February 4, 2019. She moved here in 1973 from Seneca Falls, NY and was the Deputy Director of Department of Public Welfare for 38 years, a member of Our lady of Lourdes Catholic Church, President of Port O’ Call Airstream Park for 6 years and President of South Brevard Senior Center 5 years. William Good of Simi Valley, CA; 4 granddaughters, 8 great-grandchildren and a sister, Marie Chalker of Melbourne. She was predeceased by her husband, Joseph Good; Granddaughter, Cindy; Sisters, Betty Barnet-Thielle and Frances Hamill. 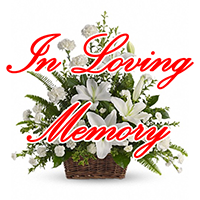 A celebration of life will be celebrated on Tue., February 12, 2019 at 2:00 pm at Brookdale, 1765 W. Hibiscus Blvd. in Melbourne. Will be praying for all the family. Alice was a wonderful lady and will be missed by so many. So very sorry for your loss. We visited with Alice monthly as part of Space Coast Therapy Dogs. We will miss her smile when we visited with our Therapy Dogs, she was always ready to chat and pet them. Prayers for your family at this time.